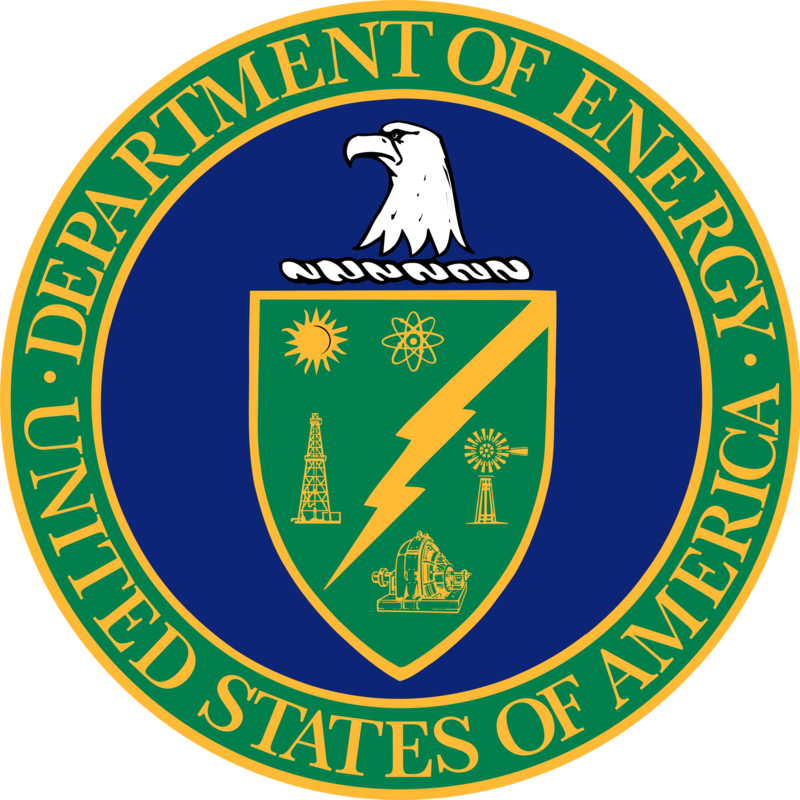 The Catalysis Center for Energy Innovation (CCEI) is a multi-institutional research center at the University of Delaware, established in 2009 by a grant from the U.S. Department of Energy, Office of Science, Office of Basic Energy Sciences. CCEI is one of many Energy Frontier Research Centers (EFRCs) and one of very few externally funded centers on heterogeneous catalysis. The center builds upon the long tradition of novel catalytic research in the Center for Catalytic Science and Technology (CCST) at the University of Delaware and extends its expertise to a team of faculty and scientific staff that brings together the expertise and synergism necessary to tackle the challenges and complexities of heterogeneous catalysis. It’s a collaboration of over 20 principal investigators and approximately 40 graduate students and postdoctoral researchers from 12 institutions nationwide. ABOVE: Watch an introduction to the University of Delaware’s Catalysis Center for Energy Innovation—an Energy Frontier Research Center—as wood chips and cornstalks take on a new shade of “green,” converted into new fuels and other products. 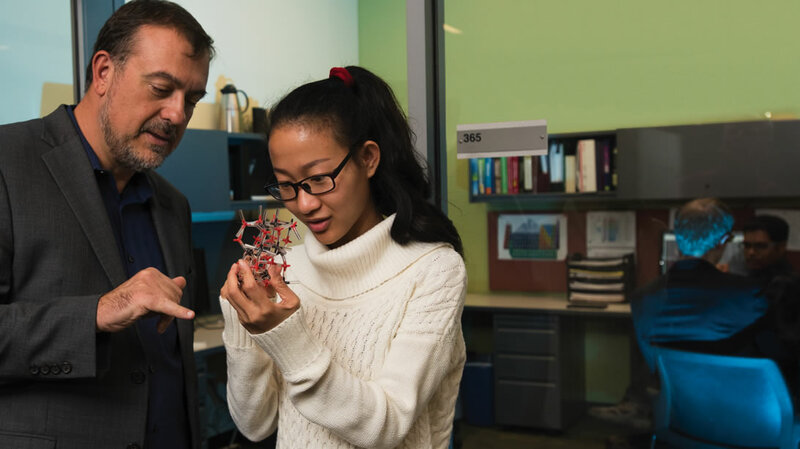 Featured in the image, CCEI Director Dion Vlachos and doctoral student Hannah Nguyen use a model of a catalyst to discuss its structure and properties. CCEI’s mission is to develop innovative heterogeneous catalytic technologies to transform lignocellulosic (non-food-based) biomass materials into fuels, chemicals, and advanced materials. The cornerstone of CCEI research lies in advancing catalysis and its integration into processes that deliver innovative technologies for the conversion of biomass feedstocks, specifically carbohydrates and smaller oxygenated molecules. Our scientists and engineers have extensive expertise in many crucial research areas, including materials synthesis, multiscale modeling, characterization, kinetics/catalysis, thermodynamics, systems analysis, and more. Find out more about our multi-institutional team of principal investigators by clicking here. We focus our research efforts on realizing significant scientific impact that assists in enabling the U.S. to meet the energy challenges of the future by developing catalytic technologies for sustainable energy applications through a spectrum of processes envisioned in a future biorefinery. The center provides a multiscale integrated approach to solving scientific and engineering problems that spans across scales and disciplines, including (1) synthesis and characterization of novel catalysts, (2) development and application of multiscale modeling, (3) reaction and reactor evaluation, and (4) technology transfer. CCEI offers a vibrant and exciting environment that educates and stimulates the next generation of engineers and scientists needed in heterogeneous catalysis and reactors, biorefineries, and renewable energy sectors. You can’t put a tree limb or a corncob in your gas tank and expect to get anything but a strange look and a bill from your mechanic. But that kind of fodder could one day be a fuel source as cheap and common as fossil fuels are now, providing renewable, sustainable raw materials for biorefineries that turn such agricultural waste into fuels, electricity and chemicals. 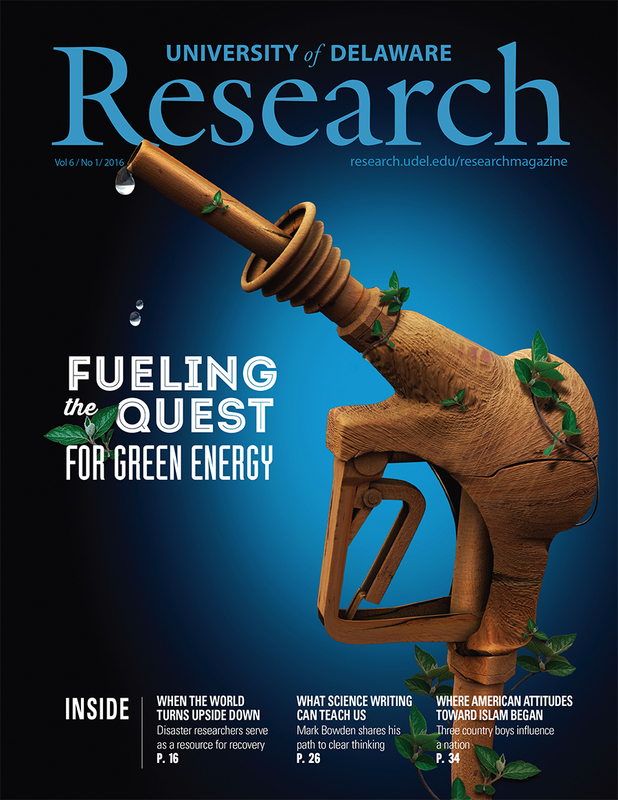 To learn more about CCEI’s mission to develop a range of new catalysts that will convert inedible biomass into sugars and oils that can then be used in fuels and chemicals, check out this cover story for University of Delaware’s Research magazine.